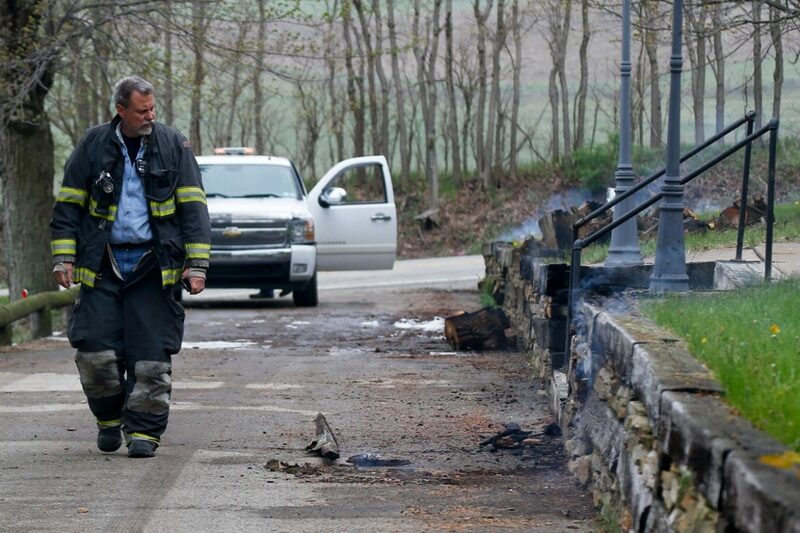 A first responder walks by smoldering wood and a burning retaining wall near a home following a natural gas explosion at a pipeline complex, on Friday, April 29, 2016, in Salem Township, Pa. The explosion caused flames to shoot above nearby treetops in the largely rural area, about 30 miles east of Pittsburgh, and prompted authorities to evacuate businesses nearby. On the morning of April 29, a natural gas transmission line exploded in a field in Salem Township in western Pennsylvania. The blast was so powerful it ripped a 12-foot crater into the landscape, burned a section of the field with a quarter-mile radius and threw a 25-foot section of the 30-inch steel pipeline 100 feet away. At the time of the explosion, a 26-year-old man was in his house, a few hundred feet away. He was badly burned, and his home destroyed. When local fire chief Bob Rosatti arrived at the scene, the flames were so hot, he had to stay in his truck. Investigators think external corrosion on the pipe is to blame for the blast. But they are still poring over a decade’s worth of pipe inspection reports to determine exactly what caused it. The explosion comes as the federal government is undertaking a new effort to make gas transmission pipelines safer. It has become an even more urgent issue now that the country is building more pipelines. Between 2004 and 2013, the natural gas industry spent 56 billion on new oil and gas pipelines nationwide, according to the Department of Energy. Department of Energy, Office of Energy Policy and Systems Analysis. Ventyx data. 2015. These natural gas transmission lines carry gas at high pressure across long distances. Currently, there are 300,000 miles of these lines in the U.S. And many residents who live in the path of these new pipelines are asking if they should be worried about accidents like the one in Salem Township. 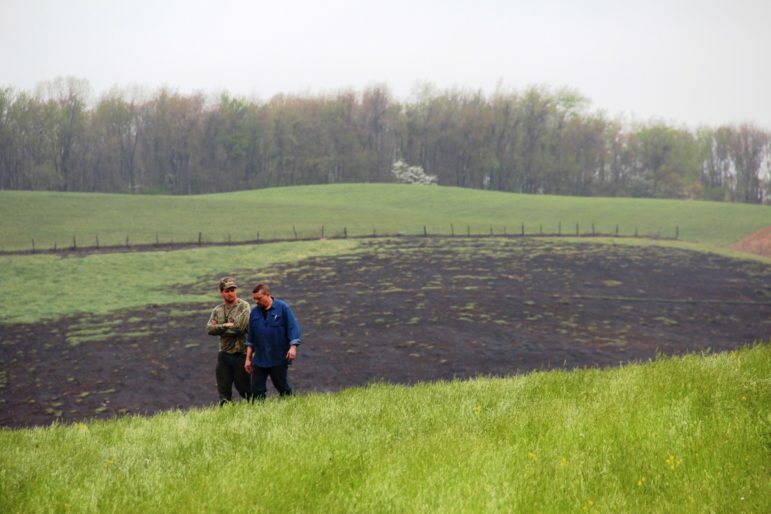 Two men walk the scene of a natural gas transmission line explosion in western Pennsylvania, April 29, 2016. The blast was so powerful it ripped a 12-foot crater into the landscape and burned a section of the field with a quarter-mile radius. Segina says what upsets her the most is how long it took for the company to shut off the gas in the pipeline after the explosion. “It was active for almost 55 minutes before they were able to shut it down, because someone had to drive 15 miles to shut this valve off,” she says. Overall, pipelines have steadily gotten safer over the past few decades—though more than 300 serious pipeline incidents have resulted in 132 deaths in the past decade, according to the U.S. Department of Transportation. Suburban Pittsburgh resident Rob Brown is among those who are uncomfortable with his home’s proximity to a pipeline. Brown lives in Murrysville, where Dominion Transmission wants to put a 30-inch diameter natural gas pipeline through his property, along an existing right-of-way, about 200 feet from his back door. When Brown, a radiologist, first heard about the pipeline, he thought about moving, but thought against it. “Its’ not that easy to move and resettle,” he says. News of the explosion jolted him. He says he keeps thinking about James Baker, the man injured in the Salem Township explosion. He says the explosion raised the alarm for people in his suburban neighborhood. 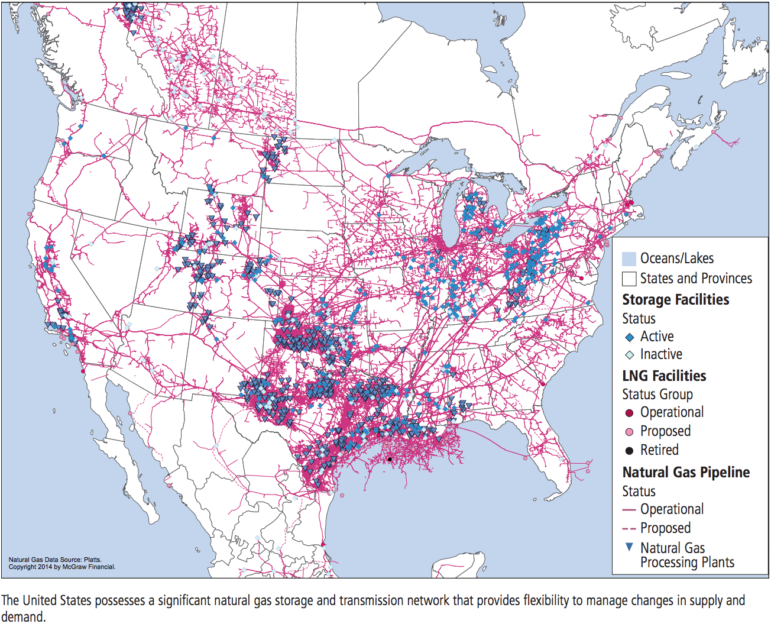 But Frank Mack, a spokesperson for Dominion Transmission, says that—by the numbers—moving natural gas via pipeline is the safest form of energy transportation in the U.S.—far safer than transporting other fuels by rail or truck. He says the company uses various methods, including aerial and ground inspections, to keep its pipelines safe. Given that the area is “pretty heavily populated,” Mack says using an existing right-of-way would have the least impact on the environment and surrounding communities. As the rules are currently written, pipelines in densely populated areas undergo the most stringent safety inspections. But the agency is proposing to extend some of these protections to suburban and less-populated areas. PHMSA also wants to add more pressure testing for older lines. A separate rule could mandate increased use of automatic shutoff valves, which would have stopped the Salem Township fire sooner. PHMSA did not respond to interview requests for this story. But Stacey Gerard, the former safety chief at the agency, says the rate at which the regulators can tighten safety rules for pipelines is slow. She says any new rule must pass a cost-benefit analysis. If the projected costs of imposing the rule outweigh the benefits, the government can’t pass it—even if those benefits include avoiding property damage, injuries and deaths. For example, a rule that saves a human life must yield a benefit of $9.4 million—an amount determined by a federal government metric known as the “value of a statistical life.” Gerard says that hampers the ability of the agency to impose safety regulations. Further complicating matters is the fact that most pipelines were built in places that once were rural but are now seeing increased development. Today, more than 12,000 schools in the U.S. are within 1,000 feet of a major natural gas transmission line. Gerard says decisions about where to site pipelines are often made at the local level, which makes the job of federal safety officers even harder. Reid Frazier reports for The Allegheny Front, a public radio program on Pennsylvania’s environment. For more of their pipeline coverage, check out their series Follow the Pipeline. Reid R. Frazier covers Marcellus shale and energy for The Allegheny Front. His work has aired on NPR, Marketplace, and Burn: An Energy Journal. He's won awards from the Radio Television Digital News Association, the Pennsylvania Association of Broadcasters, Pennsylvania AP Broadcasters Association, and the Press Club of Western Pennsylvania. He lives in Pittsburgh with his wife, Marijke, daughters Anya and Ruby and Irene, the sidewalk terrier. Protesters gathered all around the country this week in opposition to a controversial crude oil pipeline. The Standing Rock Sioux, the tribe opposing the Dakota Access pipeline project, are worried that if there was an accident, the pipeline could contaminate their water. How serious are these risks?